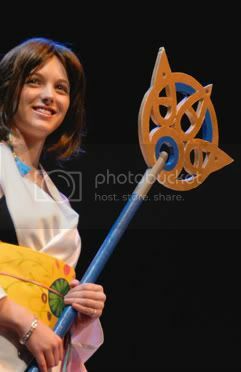 One of my current projects is to fix up my old staff from my summoner Yuna (Final Fantasy X) costume. It was originally made in 2007 for the Anime Boston Cosplay Human Chess Match and consisted of foam board and an old broom stick. Unfortunately foam board is not especially durable and in the chess match it took quite a beating. Before I bring this prop out again for Anime Boston 2012 I decided to cover the foam board entirely with wonderflex to make it more resilient. Once my new roll of wonderflex arrived I was excited to get some progress done. I traced the foam board and cut out the two main pieces. The heat gun I use when working with wonderflex, however, is technically my father's, and since I moved out of my parents house I don't have as immediate access to it. Without the heat gun I could only do so much, but I was so anxious to keep working I got a little stupid. I chose to hot glue the wonderflex to the foam board. It was a bit of a struggle to get enough glue on to place the wonderflex before some glue had cooled, but at the moment it seemed to work alright. Fast forward a day: I've got my heat gun and start cutting out edge pieces to cover the sides and cut outs and to better fasten the main pieces together and to the foam board. Lo and behold, everywhere I placed hot glue is raised and bumpy. Had I been patient I could have tried to adhere the wonderflex directly to the foam board and it would have laid flat with ease. As it is I was able to flatten it a little with my heat gun, and will probably be able to buff out the rest of the bumpiness with sand paper, but it won't be as good as it could have been, and the perfectionist in me will always remember that.